Check them out now! There is no other contact lens colour that can catch attention more than violet! With these contacts you will enjoy good eyesight as well as beautiful looks. A pack of 2 lenses. With these contact lenses your eyes will significantly, yet delicatley change their colour into beautiful violet. Your eyes will be mesmerizing! What's more, by using Neo Cosmo N223 Violet contacts you will improve your eyesight as they are available in corrective powers. Thanks to great comfort of use, they can be worn on a daily basis. 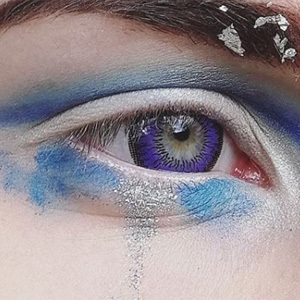 Try NEO Cosmo 2 Tone N223 Violet contact lenses if you are looking for prescription coloured contact lenses that look natural and feel comfortable. * All medical and technical information is provided by the manufacturer Neo Vision and all editorial content by Optyk Rozmus Eye Care.